Proudly standing in his bright yellow Wellington boots and with his iconic "Please look after this bear" tag, this marmalade-loving bear comes complete with his classic red felt bush hat, wooden toggle buttons, and felt blue duffle coat with yellow embroidered buttons on the cuffs. 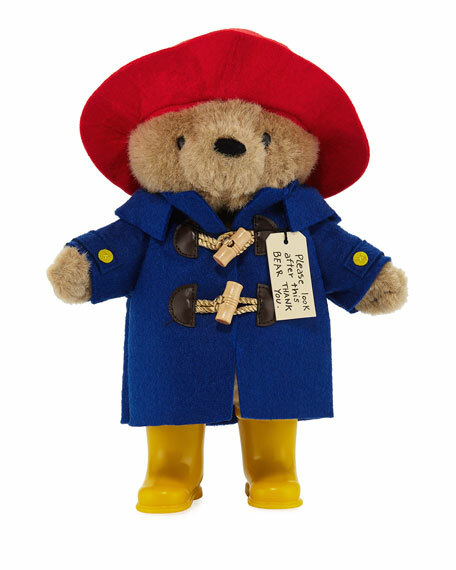 This Paddington Bear is a genuine classic to be cherished! Beloved Paddington classic bear, bright yellow Wellington boots, authentic "Please look after this bear" tag, red felt bush hat, wooden toggle buttons, felt blue duffle coat with yellow embroidered buttons on the cuffs. 9"W x 3"D x 10"T.